Following the completion of the penultimate event of the season on the European Challenge Tour, South Australian Nick Cullen can be comforted in the knowledge that he has a place to play after sealing his card on Europe’s secondary Tour for 2017. What he needs to do to claim a main tour card in next week’s season finale has also become abundantly clear, following the completion of the Ras Al Khaimah 2016 Golf Challenge in the United Arab Emirates. 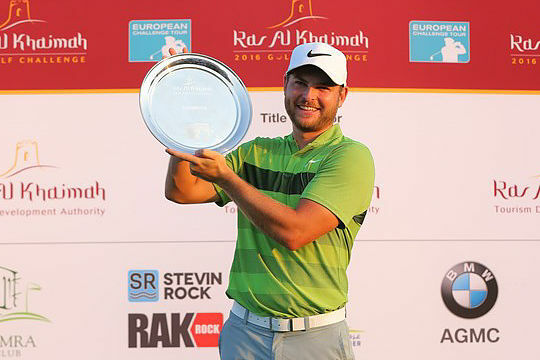 A late surge on the back nine gave England’s Jordan Smith the title in the UAE, his second of the year, and secured him the Road to Oman top spot. For his part, Cullen survived his first hurdle which was to make the cut and retain his place in the Top 45 players to play NBO Classic Grand Final in Oman next week. However his tied 24th finish was not enough to give him a substantial boost in the Money List and he heads to Oman in 39th place, with the Top 15 players at the end of next week earning full cards for 2017. Cullen is currently around €42,000 behind the man in 15th place, France’s Joel Stalter, and with next week’s first and second place cheques worth €68,250 and €44,800 respectively, nothing short of first or second will do for the 32-year old former Australian Masters champion. New Zealand’s Ryan Fox improved his ranking to 3rd ahead of the final event and is assured his place on the European Tour for 2017.